Staying safe when living in an apartment building is important in case a fire breaks out. 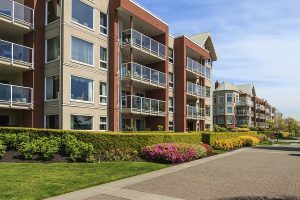 If you live in any type of apartment building, especially anything above the first floor, fire safety becomes a critical component of renting your apartment. In fact, if you reside in an apartment building above the first floor, you most definitely should have a plan in place in case a fire breaks out. Here are some tips for both residents when it comes to fire safety in an apartment building. One of the first things a new tenant should do before they move in is to be clear on the evacuation plan for an emergency situation. In fact, most apartment buildings should have a diagram clearly posted on every single floor depicting the protocol for an evacuation if a fire breaks out. As a result, taking the time to notice the signs before you fully move in is necessary for any new tenant to an apartment building. Knowing where the nearest fire exit is located is essential. In fact, before moving in, be sure to ask questions about where fire exits are located and the relation of them to your particular unit. Finding the nearest fire exit to your apartment is critical for your personal fire safety. Ideally, you’ll want to keep an extra set of house keys and a flashlight in your nightstand for a fire emergency. If a fire does conveniently break out in the middle of the night, having the essentials like your house keys and a flashlight right in your bedside drawer makes it a lot easier for you to evacuate your unit. Within every unit, there must be smoke alarms. In fact, under the NFPA, every apartment unit should be equipped with properly working smoke alarms. However, sometimes as tenants move in and out, the testing of the smoke alarms goes unnoticed. As a result, being proactive towards for your fire safety by ensuring that your units smoke alarms are in proper working condition is necessary for the safety of yourself and the building in general. This entry was posted on Thursday, August 24th, 2017 at 11:40 am. Both comments and pings are currently closed.